Get off I-35 at Hwy 152 (Exit 16) and head east on W. Kansas St to the Liberty Square. Double-back and head north on I-35 to Kearney. Get off at Exit 26 and head east on Hwy 92. Watch for signs to Jesse James Farm and Watkins Mill State Park. Turn south on Hwy 69 to Excelsior Springs. Take Hwy 10 east through Excelsior Springs, then Hwy M north and Hwy U east to Rayville. Take Hwy C and then Hwy 10 to Richmond. 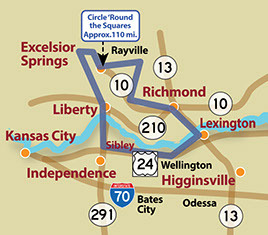 Take Hwy 13 to Lexington, then back west on Hwy 24 (or Hwy 224, the Old Trails Scenic Byway). From Buckner, take N. Buckner-Tarsney Road to Sibley. Double-back to Hwy 24, then west to Hwy 291, then north to Liberty. Explore the quaint town squares of Liberty and Richmond. In between, you can see the birthplace of outlaw Jesse James, tour the revived early-20th Century spa of Excelsior Springs, sip a soothing glass of wine, pick up some prime Missouri peaches, get lost in a corn maze, even ride a zip line! Historic Downtown Liberty offers a blend of fascinating history along with upbeat contemporary shopping and dining. Explore unique one-of-a-kind, owner-operated shops including Main Street Goods & Goodies. The Jesse James Bank on the square was the site of the nation’s first successful daylight peacetime bank robbery. Northwest of Kearney, the Mt. Gilead School and Church (open daily by appointment) offer a nostalgic glimpse of rural life. Northeast of Kearney is the Jesse James Farm and Museum. The birthplace of the famous Confederate guerilla and bank robber has the world’s largest collection of James family artifacts. Just off Hwy 92 is Watkins Woolen Mill State Historic Site and adjacent Watkins Mill State Park. Tours of the woolen mill and Watkins family home offer a unique glimpse into both industrial and domestic life in the 1870s. From the 1880s to the 1950s, visitors flocked to Excelsior Springs’ health spas, hotels, and entertainment establishments. Everyone from gangsters to President Harry Truman came to relax and ‘take the waters.’ Mineral waters are still available at the Hall of Waters, with shopping and dining in the revitalized downtown historic district. Near Rayville, sample fine Missouri wines and enjoy gourmet pizza from the wood-fired oven on the garden patio at Van Till Family Farm Winery. Ready for a thrill? North of Rayville, ShowMe Ziplines has nine lines ranging up to 2,000 feet! Then relax and enjoy some peace and quiet at Rocky Creek Valley Farm, an agricultural and educational center practicing natural plant and animal husbandry. On the way to Richmond, seek out the Red Shed Soap Co. for handmade scented soaps. 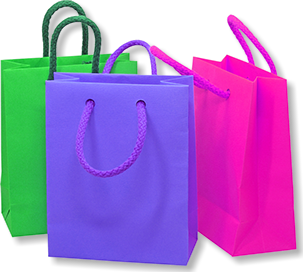 You’ll find more shopping opportunities in and around the square in Richmond. Visit the Ray County Museum for Civil War memorabilia, Indian artifacts, and Mormon history. Pioneer Cemetery has graves of “Bloody Bill Anderson” and Mormon founders. Cross the Missouri River and head back east from Lexington on Hwy 24. In no hurry? Take the Old Trails Scenic Byway along the Missouri River from Lexington through Wellington and Napoleon. Then, at Buckner, turn north to Sibley. You’ll soon see Sibley Orchards & Cider Mill where you’ll find apples, peaches and berries, in season. A few more miles brings you to Fort Osage National Historic Landmark, a fascinating, authentic reconstruction of the fort complex founded by explorer William Clark in 1808. Heading back to Liberty, stop for some fall fun at Carolyn’s Country Cousins Pumpkin Patch and adjacent Liberty Corn Maze. The 25-acre maze features a different design each year. Do not print this webpage. 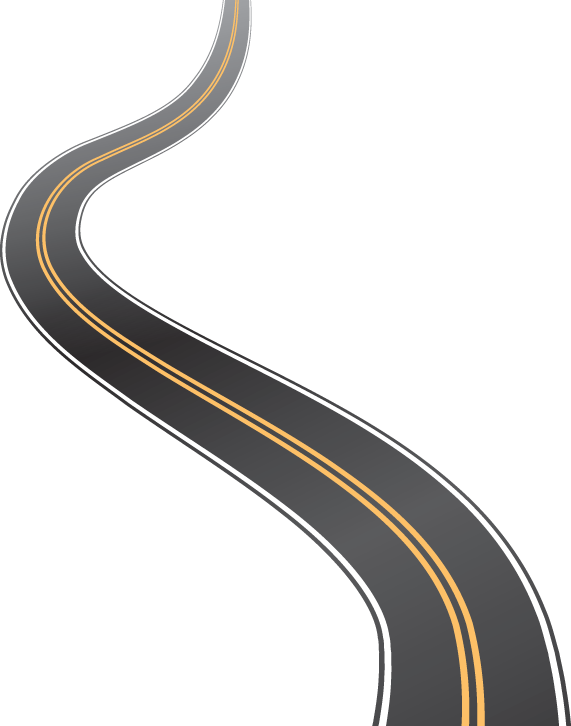 Click the "Download a PDF of this route" link under each route below. Then print from the PDF to your printer. Each route is two pages. Get off I-70 at Hwy 13 (Exit 49) and head north to Higginsville. Continue north on Hwy 13 to Lexington. From Lexington head east on Hwy 24, the historic Santa Fe Trail, where you’ll see several wineries, orchards and roadside markets. Just beyond Waverly, head north on Hwy 65, crossing the Missouri River, to reach Carrollton. Take Hwy 65 back south from Carrollton to Marshall. 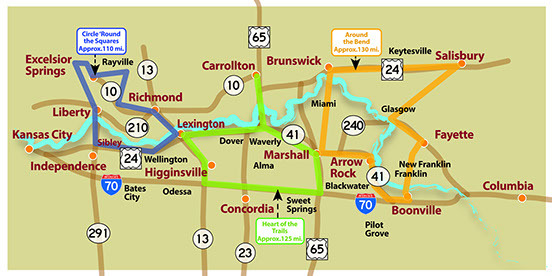 Continue south on Hwy 65 to I-70, then west to Exit 49, the point of beginning. 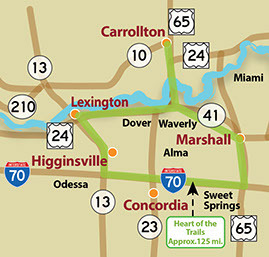 Get off I-70 at Hwy B (Exit 103) and head north through Boonville, crossing the Missouri River on Hwy 40. Turn off Hwy 40 onto Hwy 5 north to Fayette. Take Hwy 5/240 to Glasgow. Go north on Hwy 5 from Glasgow to Hwy 24. Turn east on Hwy 24 to Salisbury. 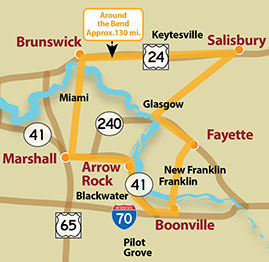 Go back west on Hwy 24 through Keytesville to Brunswick. Continue west from Brunswick on Hwy 24 to Hwy 41, just past De Witt. Go south on Hwy 41, crossing the Missouri River again at Miami. On the north edge of Marshall, Hwy 41 turns east to Arrow Rock. From Arrow Rock, go south on Hwy 41 to Hwy K. Turn west on Hwy K to Blackwater. Follow Hwy K to get back onto I-70 at Exit 89. Go east on I-70 to Exit 103, the point of beginning. Historic towns and former steamboat ports cluster on both sides of the big bend of the Missouri River here. Browse one-of-a-kind shops, bring home fresh pecans and produce, and listen for the echo of a steamboat whistle as you cross the Big Muddy. Boonville is the gateway to this area. Start or end your trip with a snack or meal at The Fred restaurant and lounge in the historic Hotel Frederick—a great place to extend your day to an overnight stay. Fayette is the picturesque seat of Howard County. Stroll around the Courthouse Square and visit Main Street shops. Nearby, check out Miller Farm and Orchard for seasonal goodies. Glasgow began as a thriving steamboat port and boasts many interesting shops and antebellum homes. Pause to refresh with a glass of Bushwhacker Bend Winery’s best on a tranquil deck on the banks of the Missouri. North of Salisbury, Shepherds Way Arts & Crafts offers hand-spun yarn and hand-woven items. The 1898 Queen Anne Brummall House Bed & Breakfast provides a wonderful Victorian atmosphere for a relaxing getaway. Passing through Keytesville, home of Confederate General Sterling Price, you may want to plan in advance to take a Chariton County Heritage Tour. West of Keytesville, stop at King Hill Farms for Missouri River bottom pecans and seasonal produce. The town of Brunswick, “Missouri’s Pecan Capital,” offers not only the “World’s Largest Pecan” but also the opportunity for a tasty break at Kaitlynn’s Deli and Ice Cream Shop. The village of Arrow Rock is located at the crossroads of the Missouri River and the Santa Fe Trail. The entire town is designated as a National Historic Landmark, full of friendly people, great restaurants and shops, and fascinating historical attractions. 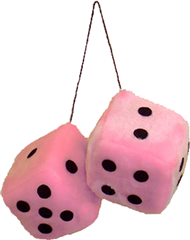 Visit the Friends of Arrow Rock Museum Shop. Sample the “Best Fried Chicken in the State” at the 180-year-old J. Huston Tavern. Stretch your stay to catch a performance at the Arrow Rock Lyceum Theatre, then sink into comfort at Borgman’s Bed & Breakfast or Prairie Park B&B. 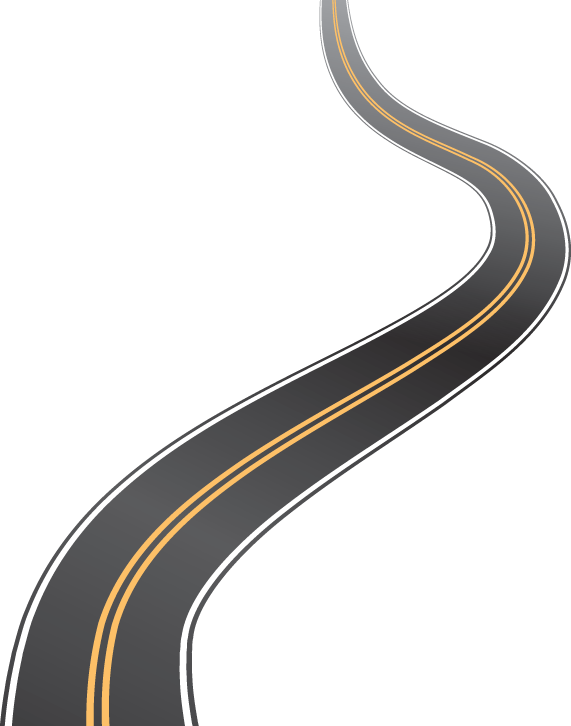 In five minutes you can be back on I-70, but memories of your trip “Around the Bend” will last much longer!